# And they used to call Rome Babylon # [ve-havi korin lay Romi Babklon]. 'There is a lot of evidence that Christopher Columbus was a man of faith seeking to help his brethren escape certain death or conversion in Spain and even that he dreamed of rebuilding the third holy temple in Jerusalem,' noted Roni Segal, academic adviser for The Israel Institute of Biblical Studies, an online language academy, to Breaking Israel News. It has long been assumed that Columbus was an Italian explorer from Genoa who set sail for Asia in 1492 to supply the Spanish monarchs with gold and spices. However, the the new theory holds that Columbus' actual name was Cristobal Colon, the name signed on his letters. It is believed that he was from Spain, the child of Domingo de Colon and Suzana de Fonterosa, Jews forced to convert to Christianity, referred to as Marranos, who were makers and sellers of nautical maps. Many Jews at the time feigned conversion to save their lives. They practiced Catholicism in public and Judaism in private. ... In his last will and testament he asked that a tithe of one-tenth of his income go towards the poor and provide a dowry for needy brides. This is a common Jewish custom. Additionally, he left money to a Jew who lived in the Lisbon Jewish Quarter, something that would have been unheard of from a Catholic Spaniard. Columbus also left money to other explorers with the belief that his successors would eventually liberate the Holy Land. Simon Weisenthal writes in his book 'Sails of Hope' that Columbus' voyage was motivated by a desire to find a safe haven for the Jews suffering from the Spanish Inquisition. Echoing this sentiment, Carol Delaney, a cultural anthropologist at Stanford University, believes that Columbus was a deeply religious man who sought riches in order to finance the return of Jerusalem to the Jewish people and the rebuilding of its holy Temple. Perhaps even more telling, Columbus signed his last will and testament with a triangular signature of dots and letters similar to what is inscribed on gravestones in Spanish Jewish cemeteries. In fact, he ordered his heirs to use this symbol in perpetuity. Though history claims that Columbus' voyage was funded by Queen Isabella, in actuality it appears that Jewish Conversos (those who converted by force to Catholicism) and prominent Jews gave the explorer an interest-free loan. These investors included Louis de Santangel, Gabriel Sanchez and Rabbi Don Isaac Abrabanel, a known Jewish statesman. 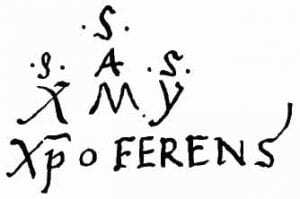 Indeed, Columbus' initial letters discussing his journey were sent to Santangel and Sanchez, thanking them for their support and telling them what he had found. 'Irizarry also notes that Columbus occasionally included Hebrew in his writings and references the Jewish High Holidays in his journal during his first voyage,' continued Segal to Breaking Israel News. Wiesenthal postulates that Columbus sailed west to reach the Indies because of his Biblical faith, including from the Book of Isaiah, which he repeatedly cited in his writings. Given these facts, Columbus' discovery of America, a country symbolized by religious tolerance and freedom, goes hand in hand with his Jewish heritage. Vitrification occurs as a result of exposing silica or stone to extreme heat. The process has been determined at several ancient sites around the world. While some can be shown to have been caused naturally, there have been several recent studies that show it to have been done as a deliberate act. Vitrified ruins have been found Scotland, England, Ireland, France, Turkey, Iran, Germany and elsewhere, however, out of some 100 forts identified throughout the world, more than half are located in Scotland. What is a vitrified Fort? A Vitrified fort is a 'hill-fort' with stone ramparts/walls which shows evidence of having been subjected to extreme heats (over 1000 C), causing the rocks to melt and fuse together. Although in some cases, this may have occurred accidentally, but there are several factors which indicate that it was a deliberate act. The analysis of vitrified forts has provided us with enough evidence to show that vitrification, in most cases at least, was a deliberate act. The following examples demonstrate. There are some forts which have been placed on practically infusible rock, such as the quartzose conglomerates of the Old Red Sandstone, as at Craig Phadraic, and on the limestones of Dun Mac Uisneachain. In these examples, pieces of fusible rocks have been selected and carried to the top from a considerable distance demonstrating that the act of vitrification was deliberate. The vitrified walls of the Scottish forts are invariably formed of small stones which could be easily acted upon by fire, whereas the outer ramparts where used, are not vitrified and are built of large blocks. Many of the continental forts are so constructed that the fire must have been applied internally, and at the time when the structure was being erected. Daubree, in an analysis which he made on vitrified materials taken from four French forts, and which he submitted to the Academy of Paris, in February 1881, found the presence of natron in such great abundance that he inferred that sea-salt was used to facilitate fusion again suggesting that it was a deliberate act. Hamilton describes several sites in detail, including Arka-Unskel, which he found that the rampart of local Gneiss was covered with imported feldspatic sanstone in order to create the vitrified effect. This method found also in the vitrified fort of Dun Mac Snuichan, on Loch Etive.